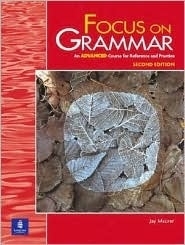 This book is part of an integrated skills course that makes grammar fun and accessible. KEY FEATURES: More practical than ever, this book has a fresh new design with more photos and illustrations. Also the From Grammar to Writing feature reinforces grammar acquisition while improving readers writing skills. This book also includes a more challenging testing program including TOEFL-type questions. For advanced ESL readers needing reference and practice.